UFC flyweight John Dodson has quickly made a name for himself in the lightest division in the world’s premier fighting organization with his rare combination of athletic brilliance and uncommon knockout prowess. Saturday, serving as the opening fight for the UFC 166 pay-per-view broadcast emanating from the Toyota Center in Houston, Dodson met UFC newcomer Darrell Montague. Seeing as Dodson’s most recent fight was in a “Fight of the Night” title loss to Demetrious Johnson at UFC on FOX 6, the prospect of fighting such a seasoned veteran in his UFC debut was surely a daunting task for the young upstart, in Montague. Round one saw both fighters open with a visibly quickened pace. 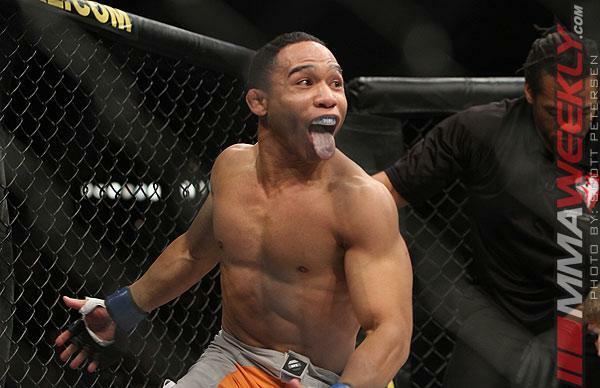 Dodson, the former title contender, winged his signature lunging punches just seconds into the opening frame. Montague countered with slicing inside leg kicks – one of which left the “Magician” grimacing in discomfort. The two scrappers exchanged combination punches and leg kicks for the next two minutes, as a feeling out process took place. Later in the first, Dodson began to open up on the 25-year-old. It was a lightning quick left cross that dropped Montague at first. The youngster fell to the canvas as Dodson rushed in for the finish. Dodson unleashed a flurry of quick uppercuts and frenetic ground and pound and it looked as if Montague was finished. However, Montague managed a rather surprising recovery and found himself back on his feet. Unfortunately for Montague, that recovery didn’t last long. As the final minute ticked away, Dodson started to stick Montague with beautiful body-body-head combo punching. Finally, that lead left cross found its home once again, and Montague was out, falling face first to the canvas. Montague hit the mat, with Dodson following with a brief set of follow up punches, but they were hardly needed. The end officially came at 4:13 of round one, with John Dodson winning by way of knockout. Post-fight, the victorious Dodson talked about the changes he made since his unanimous decision loss to “Mighty Mouse” in his last outing. The patience certainly showed for Dodson, as he certainly took his time in picking Montague apart. Perhaps the old Dodson would have rushed in with a risky flurry trying to finish the fight earlier in the first. When he did finally connect, it was with textbook precision and the aggression we’ve become accustomed to when Dodson enters the cage. Be sure to Like MMAWeekly.com on Facebook and Follow @MMAWeeklycom on Twitter.